LTC (OF-4, GRC-ARMY) Dr. Vyron Antoniou is currently assigned to the Multi-National Geospatial Support Group in Euskirchen, Germany as Head of the Terrain Analysis Brach. 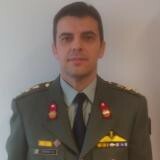 He has served in the Geographic Directorate of the Hellenic Army General Stuff, as Head of the Cartography Branch and as Head of the Remote Sensing Branch of the Hellenic Military Service. He has studied Surveying and Rural Engineering at the National Technical University (NTUA) of Athens, Greece. He holds an MSc in Geoinformation from NTUA and a PhD from University College London (UCL), UK in Geomatics. His research focused on the analysis of VGI and its challenges for mapping agencies. His research interests are in GIS, spatial databases, spatial analysis, Web mapping applications, VGI, spatial data quality, OGC specifications, ISO standards, XML and Web 2.0 technologies in Geomatics. He has been a Lecturer at the Hellenic Military Academy and a guest Lecturer at the National Technical University of Athens. He is a Member of the Technical Chamber of Greece since 2005; an Honorary Research Fellow at UCL since 2012; a management committee member of the EU COST Action CA 15212 “Citizen Science to promote creativity, scientific literacy, and innovation throughout Europe” and a UCL ExCiteS Project Affiliated Researcher. Check out the incredible speaker line-up to see who will be joining Vyron .